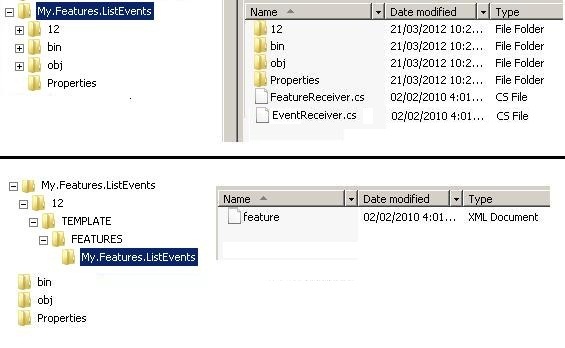 In this article I will describe that how to create event handler for specific list using sharepoint feature. Here I will take example of Item Added & deleting action event. On added event, we will add item description and on deleting event, we will not allow to delete. This article example shows the basic steps used to create an event handler. In this example, feature receiver class add event handler on list and then event handler executes code before a list item is deleted or after an item is added. The example works on announcement lists, adding text to the body of new items and cancelling attempts to delete existing items. We will create below feature.xml file and 1 featurereceiver.cs file. Then rest is usual WSP deployment on sharepoint. You use this XML file to define the metadata for the new feature. The following example code scopes the feature at the level of the site and defines a unique identifier for the new feature. This class will add event handler on sharepoint list named as “MyList”. // Similarly you can add other events also if required. This class have Item Added & deleting action event. On added event, it will add item description and on deleting event, it will not allow to delete.